This rather unknown peak in the Banjaran Titi Wangsa mountain range, is located at a relative short distance (about 50Km) from the Ampang suburb of Kuala Lumpur and yet far away from the sometimes annoying bustling of the suburban life. The trip was made possible through the services of the Mountain Goal Adventure organization and its ineffable chief expeditioner Thong. As I was looking for a no-frills, lay-down type of escape, I could not have found anything better to ensure a genuine down-to-earth, full fledged experience in tight contact with the natural beauty of Malaysia and its people. The expedition counted 14 heads including the organizers. Through some fast climbing road bends, you will soon reach a quite peaceful natural lanscape with a few rural housing and villages scattered here and there. Past the shores of a serene artificial lake, a road junction will head directly to Kampong Chennah, where everyone knows everybody and life flows like a quiet stream. The village cheered the opportunity by providing additional enthusiastic supporters who in turn climbed in the truck as occasional trip companions. Almost midway we stopped to take in a couple of Orang Asli (malay aborigens), Awang and Ali, as guides and, as I will reckon much later, mostly as teachers of natural knowledge and wisdom.In Kampong Chennah we let go of our city-car transportation, evidently not suited for the further inland roads and boarded two robust all-terrain 4×4 pick up trucks. 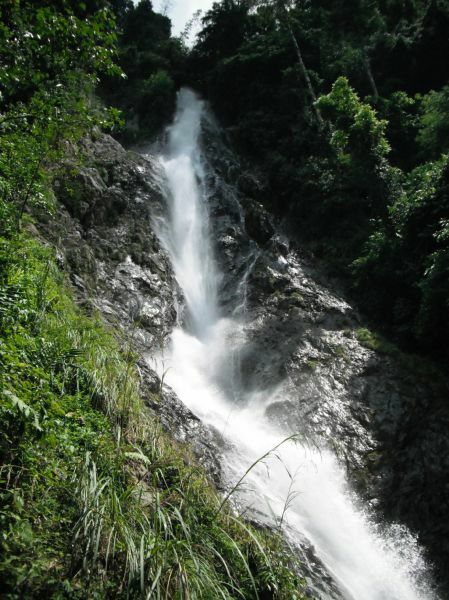 The road ended at a majestic waterfall, Lata Kijang, sporting an almost vertical fall of 30 meters. At the foot of the waterfall, a rocky stream forms ponds and natural pools to provide fresh water supply and refreshement to the passers-by. The sound of the stream can resemble the fated song of the Mermaids lulling the wanderer to take a prolonged rest, which we did with renewed pleasure on the way back. From there on a steep and badly maintained iron staircase pointed vertically straight up into the forest, with no end in sight. From there on we had to count only on legs, shoulders and good spirit. We camped after 5 hours of trekking inside the ups and down, the never ending roots and forest decay typical of the jungle treks. 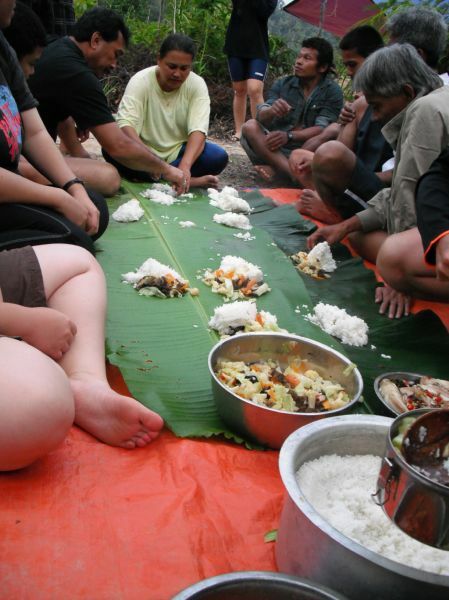 Thong preceded all of us and started preparing a delicious malay kampong food which was served on gigantic banana tree branches while all the tents were scattered on the scarce flat terrain all around. Most of the rest of the time at the camp was spent in cutting off the persistent leeches that were throbbing from our legs and feet in a blood frenzy feast. Rather disgusting worms, the leeches are actually very discreet as they proceed with their feeding intent without creating the minimum discomfort. Unlike the mosquitoes and the sand flies, also abundant, which make noise and stinging hassle, leeches can be spotted only by a vague sense of ticklish or the evident large stains of blood on clothes and mostly stockings. Always remember to wear high ankle shoes and thick cotton socks with long pants. You may not be totally immune, but at least can contain the plague at an acceptable level. While I was fumbling with my western inadequacy to the situation, Ali approached me with a shy smile, and humbly forked out a piece of moistened paper from his pocket, a small piece of the page of a newspaper, and cut it in minuscule portions almost the size of the bite of the leech and silently placed them on top. Almost immediately the profused bleeding stopped. His smile was imbued with the millenary knowledge of this proud and peaceful people continuously harassed by the harsh environment of the wilderness and the inevitable siege of the false promises of the so-called progress. As the name of the mountain was hinting, the long equatorial night was filled up with eerie presences. The superstition handles the fear of the unknows by figuring out monstrous and immaterial beings to be the source of the countless sounds, shrieks, cracking, whistling and pounding noises which made up a night out in the woods. A light rain was adding up the characteristic rytmic base with all the variety of responses from the large and tiny forest leaves. Tiredness made the usual miracle of donating a deep and restoring sleep troughout the night despite the quite unconfortable sleeping bag. A sudden call from nature woke me up at about 4:30am and urged me out of the tent. The long forgotten amazing show of a trillion stars, which in the meantime replaced the thick layer of clouds, left me once more speechless and astonished. Once more I was given the present of admiring the whole Milky Way, the most remote galaxies, and the fascinating and overwhelming design of the Universe. The following morning a steady 90 minutes almost vertical climb lead us to the summit. The chilling temperature was cooperating with the muscular effort and the gratefulness of the achievement did the rest. The surrounding view was exhilarating and more so the view and congratulations of your fellow climbers. 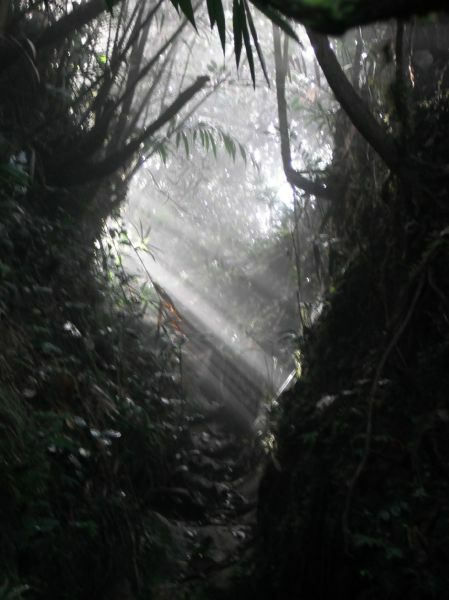 An ascent on a mountain is always a refreshing experience, not only for the variety of the natural lanscapes, the uniqueness of the vegetation or rock formations, the technical challenges that the trail provides during the trek. The true experience comes from within and from the almost rare opportunity of spending time in solitude with yourself, in a slow recovery of latent spiritual values that will surface when your inner mental noise is quieted by the phisical stress. Chemical reactions in your body enhance your senses and your capability to absorb the surrounding world is mostly overwhelming. I felt deep gratitude and somehow my circle of tolerance enlarged, with appreciation and contentness to an intensity which rarely I can remember in my ‘normal’ life. It’s an experience of simple things, the taste of a streaming water when you are really thirsty or the taste of natural food, often in the form of fruits or vegetable essences taken from the sources of Nature. An then the smell of the grass, the calling of the birds and other hidden creatures, the rustling sound of the leaves on all shape size and texture. The discovery is also with your inner self, your thoughts and feelings, your beliefs and your fears. The slow process of awareness and acquaintance with your limits, capacity, shortcomings and values takes synergy from the slow progress through the trail and the forest. And finally you realize that eventually time is yours to splurge, to knock you off, to get to accept you better and with it the whole universe. The forest is apparently a totally chaotic organization. Yet, every shrub or tree has its own function and the they all live together in harmony, sharing food and light in a great display of persistence and adaptation. Most human organizations are based on the exertion of control of the few on the many and layouts are orderly and only apparently more effective. Only who thrives at the edge of chaos shall survive. In the forest all stages of life are coexistent and cooperating in mutual support and in continuous change: the young sprouts, the decay of the dead plants and the strenght of the adult trees. The contribution of each life stage is balanced and provided in abundance. Yet no resource is wasted. Learn to appreciate the sense of belonging deriving from receiving help and be grateful for it. You will learn how to offer real help in a disinterested way with no expectation of a return. The sign of the material impermanence are evident everywhere in the forest to teach a lesson of universal tolerance since nothing is eternal and immutable. So be it for your anguish, distress and pain. And also for your pride, material satisfaction and personal success. The forest is unyielding to the walk of wanderers. All sort of unfriendly obstacles are opposing to the trek. Sometimes you have to breech into the intricacies and make your own path. The one who knows how to respect and adaptation with minimal impact will reach longer distances. The ones which need to open large passageways for greater confort will proceed slowly and will not reach far. Likewise to life. You can take along only what you can carry on your shoulders. Most comfort items are heavy. Bigger bags are heavier than smaller bags. Need to learn how to source your comfort from what the mountain and the forest offer in abundance. Most of the things you consider indispensible are just jettison of the mind. The mountain values the essential over the redundant. When you leave oll your possessions at the base camp and you prepare for the final ascent, most of times in the wee morning hours, you finally understand how important is to have developed a strong body and a strong spirit, as you won’t need much else on the road ahead. During the trek you might be largely concentrated in the labour of the strenuous ascent. You look down to avoid stepping into unfirm terrain, and to find around suitable support or handles to sustain your steadiness during uncertain moments. Every now and then with a thud, you head hits a low branch or a fallen tree, which you did not see before. Yet these were there for a reason to remind you that most of the time the help to sustain your progress must be seeked by looking up, to what is there for you coming from above you. There is only that much you can get from the lower grounds: most of the stronger support comes from the highest ones. This entry was posted in Gunung Hantu and tagged A birthday night on the Mountain of the Great Spirit. Bookmark the permalink. ← What will I really need on the road?